Ask any middle-class couple that regularly hosts a game night, and they'll tell you at length that cheese is perhaps the most complex of all foods, needing a more carefully controlled climate to ripen than most premature babies. And no one knows this better than the Swiss, whose expertise in making cheese is only rivaled by their skills in building cuckoo clocks and hiding Nazi gold. And recently, they've discovered yet another factor in determining the taste of cheese: banging beats. For the past six months, the Bern University of the Arts HKB has run a strange experiment they call "Cheese In Surround Sound." With the help of famed cheesemaker Beat Waffler, whose name implies he was put on Earth for this specific reason, eight 22-pound wheels of the finest Emmental were hooked up to mini transmitters which pumped sound straight into their curds 24/7 to see if bio-acoustics have any effect on their ripening process. 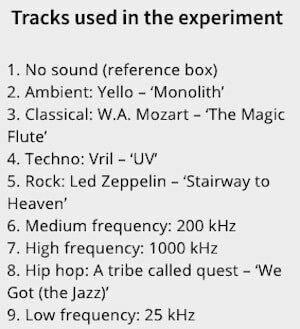 The cheesy jams ranged from sound waves at different frequencies to techno to actual music, like Led Zeppelin's "Stairway To Heaven" and Mozart's "The Magic Flute." swissinfo.chA wheel of cheese and this playlist is what pick-up artists call a guaranteed bang. Now, it might seem easy to poke holes in this Swiss cheese study, but the researchers made some startling discoveries. After a blind taste test with several experts, they concluded that most sound "affects metabolic processes in cheese, to the point where a discernible difference in flavour becomes apparent." But perhaps more shocking than our cheese silently judging whatever Spotify playlist is on during date night is the reveal that the cheese responded the best to hip-hop. The Emmental that was played A Tribe Called Quest's "Jazz (We've Got) Buggin' Out" was deemed to have by far the most delicious flavor profile, having "a discernibly stronger smell and stronger, fruitier taste." Bern University of the Arts HKBDank! Of course, with these kinds of results, the quest for the perfect cheese music has only begun. The university is already planning on launching another round of experiments, this time exposing the cheeses to several other hip-hop artists to see which ones they respond to the most. 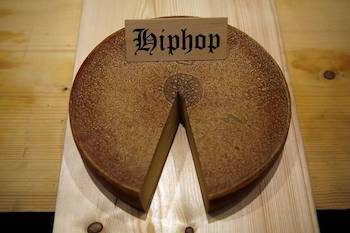 In any case, look forward to seeing several hip-hop-infused supercheeses hit the market soon. 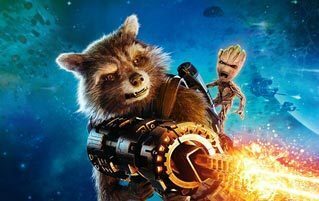 We're already looking forward to savoring the taste of Cardi Brie, Cheese Wiz Khalifa, and Goudacris. For some whine to go with your cheese puns, do follow Cedric on Twitter. 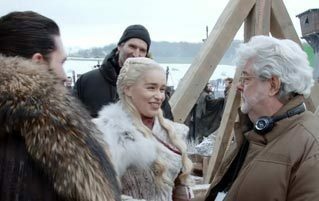 For more, check out The Big Clues In The New Avengers Trailer (Are The Haircuts) and Bryan Singer Dropped From 'Red Sonja' For The Worst Reason.